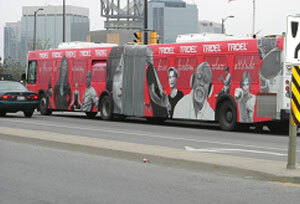 Baton Rouge, LA – June 6, 2012 – Commuters in the city of Mississauga, ON, will have eye-catching ads to look at on buses for the next five years, thanks to a new transit advertising contract. Lamar Advertising Company (Nasdaq: LAMR) signed a transit advertising agreement with MiWay for a five year term through 2017. The transit fleet includes 448 buses, which serve 738,000 residents in the city of Mississauga. 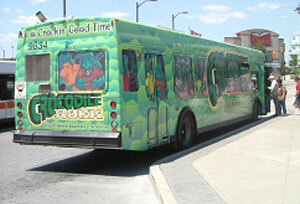 The buses cover 179 square kilometers (about 70 square miles) in Mississauga and operate 88 total routes, providing transportation between popular destinations in Clarkson, Erin Mills, Meadowvale, Cooksville, Port Credit, Dixie, Malton and the City Centre, as well as various other local neighborhoods. Lamar Transit Advertising connects advertising agencies and direct clients to the transit advertising medium, displaying advertisers’ messages on the interiors and exteriors of Mississauga buses. Founded in 1902, Baton Rouge-based Lamar Advertising Company is a leading outdoor advertising firm operating over 150 outdoor advertising companies and 60 transit advertising companies in 44 states, Canada and Puerto Rico. They reach driving audiences across the United States, Canada and Puerto Rico through billboards, digital billboards, bus shelters, benches and buses. Lamar is also the nation’s leader in the highway logo sign business, with operations in 22 states and the province of Ontario, Canada. 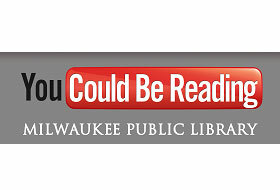 The Outdoor Advertising Association of America (OAAA) last night presented Baton Rouge-based Lamar Advertising Company with a Gold OBIE Award for its Milwaukee Public Library billboard campaign. Lamar Advertising Company (Nasdaq: LAMR), a leading owner and operator of outdoor advertising and logo sign displays, announces the Company’s operating results for the first quarter ended March 31, 2012.